The Catholic Jedi Academy: One Strong Woman! The life of Joan of Arc (1412-1431), who was born into a prosperous peasant family, took place in the context of the conflict between France and England known as the Hundred Years War. At the age of thirteen, "through the 'voice' of St. Michael the Archangel, Joan felt herself called by the Lord to intensify her Christian life and to act personally to free her people". She made a vow of virginity and redoubled her prayers, participating in sacramental life with renewed energy. "This young French peasant girl's compassion and commitment in the face of her people's suffering were made even more intense through her mystical relationship with God. One of the most original aspects of her sanctity was this bond between mystical experience and political mission". said Benedict XVI. Joan's activities began in early 1429 when, overcoming all obstacles, she managed to meet with the French Dauphin, the future King Charles VII. He had her examined by theologians of the University of Poitiers who "delivered a positive judgment, they discovered nothing bad in her, and found her to be a good Christian". On 22 March of that year Joan dictated a letter to the King of England and his men, who were laying siege to the city of Orleans. "Hers was a proposal of authentic and just peace between two Christian peoples, in the light of the names of Jesus and Mary", said the Holy Father. But the offer was rejected and Joan had to fight for the liberation of the city. Another culminating moment of her endeavours came on 17 July 1429 when King Charles was crowned in Reims. Joan's passion began on 23 May 1430 when she fell into the hands of her enemies at Compiegne and was taken to the city of Rouen. There a long and dramatic trial was held which concluded with her being condemned to death on 30 May 1431. The trial was presided by two ecclesiastical judges, Bishop Pierre Cauchon and the inquisitor Jean le Maistre, but in fact it was conducted by a group of theologians from the University of Paris. These "French ecclesiastics, having made political choices opposed to those of Joan, were predisposed to hold negative views of her person and mission. The trial was a dark page in the history of sanctity, but also a shining page in the mystery of the Church which is, ... 'at the same time holy and always in need of being purified'". "Unlike the saintly theologians who illuminated the University of Paris, such as St. Bonaventure, St. Thomas Aquinas and Blessed Duns Scotus, ... the judges were theologians who lacked the charity and humility to see the work of God in this young girl. Jesus' words come to mind, according to which the mysteries of God are revealed to those who have the hearts of children, but hidden from the wise and intelligent. Thus Joan's judges were radically incapable of understanding her, of seeing the beauty of her soul", the Pope said. 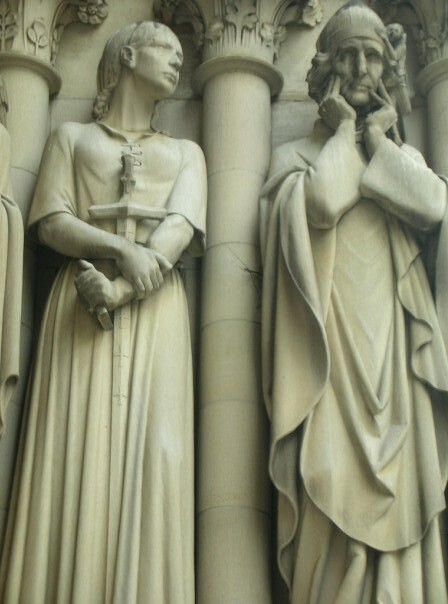 Joan died at the stake on 30 May 1431, holding a crucifix in her hands and invoking the name of Jesus. Twenty-five years later a trial of nullification, instituted by Pope Callixtus III, "concluded with a solemn sentence nullifying the condemnation and ... highlighting Joan of Arc's innocence and perfect faithfulness to the Church. Much later, in 1920, she was canonised by Pope Benedict XV". "The Name of Jesus invoked by this saint in the last instants of her earthly life was as the continual breath of her soul, ... the centre of her entire life", the Holy Father explained. "This saint understood that Love embraces all things of God and man, of heaven and earth, of the Church and the world. ... Liberating her people was an act of human justice, which Joan performed in charity, for love of Jesus, hers is a beautiful example of sanctity for lay people involved in political life, especially in the most difficult situations". "Joan saw in Jesus all the reality of the Church, the 'Church triumphant' in heaven and the 'Church militant' on earth. In her own words, 'Our Lord and the Church are one'. This affirmation ... takes on a truly heroic aspect in the context of the trial, in the face of her judges, men of the Church who persecuted and condemned her". "With her shining witness St. Joan of Arc invites us to the highest degree of Christian life, making prayer the motif of our days, having complete trust in achieving the will of God whatever it may be, living in charity without favouritisms or limitations, and finding in the Love of Jesus, as she did, a profound love for His Church".